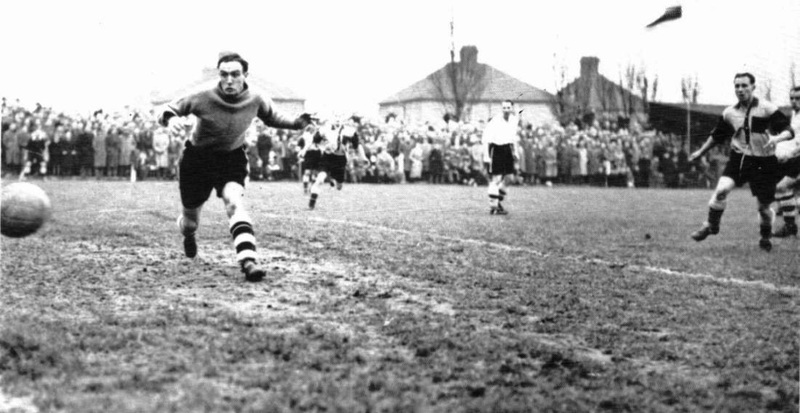 The post-World War II years saw ambitious Abbey United, soon renamed Cambridge United, climb rapidly up the non-League ladder, as this extract from Andrew Bennett's work, edited by Janet Williams, shows. 1945/46: It would be a long time before the world returned to anything like normal, but local football's first step after the end of World War II was to reform the Cambs League. There were enough clubs for regionalised northern and southern divisions, and so many southern-based clubs that they were sub-divided into sections A and B. Abbey United were placed in a nine-team Section A alongside Histon Institute and Cambridge Town's reserves. The club, needing to generate income to get back on a firm footing, also entered six cup competitions. As fate would have it, they drew Town's first team in the first qualifying round of the FA Cup, and Harvey Cornwell accompanied his son in defence six weeks after his 49th birthday. However, United were overpowered 8-0, four goals coming in each half. In contrast, they started their league campaign with an encouraging 7-1 victory over RAF Quy, which included hat-tricks by Sid High and another returnee, Don Hall, who 'showed all his old skill at inside left', according to the press report. While some players returned to United, others were leaving. A 7-0 replay defeat to Histon in the East Anglian Cup marked Harvey Cornwell's last competitive game in Abbey colours. Since his debut in September 1922, he had made over 500 appearances in all competitions and scored over 200 goals, despite leaving the club twice and the disruption of the war. He had played alongside two of his sons and assisted the club financially and practically through the years of conflict. He continued to play Thursday football for a further ten years, until the eve of his 60th birthday. Truly, we will never see his like again. A Charity Shield fixture at home to Saxons just before Christmas ended bizarrely when, at 3-3 with four minutes remaining, the referee abandoned the game because of fog; the spectators and most of the players left the field believing the game had been completed. The replay a week later was no less dramatic, United triumphing 5-4. Progress was also made in the Challenge Cup with a 7-2 dismissal of Saxons that saw the return of another pre-war player, full back Ernie Humphreys. There was bad news for United, though, with the withdrawal from the league of RAF Quy; their 7-1 and 5-2 wins over the servicemen were expunged from the record. United had a settled starting XI, a mixture of youth and experience, with Arnold in goal, Bruce and Humphreys at full back, L Maxwell, Bill Bailey and Don Hall at half back and a forward line of Reg Kimberley, J Seymour, Sid High, W Pauley and Connolly, with Keenan as back-up and the imminent return of pre-war favourite Joe Richardson, who had served in west Africa. He returned to captain United, his first love. A good finish to the season looked in store with two finals and a semi-final still to play, but it was to end in disappointment. In the Charity Shield southern final at Milton Road, Histon ran in five second-half goals for a crushing 6-1 victory. And in the southern final of the Challenge Cup, at Bassingbourn, United paid for a Bailey spot-kick miss and went down 2-1. A 4-3 defeat to Cottenham in the hosts' Nursing Cup semi-final, in front of a large Easter Monday crowd, typified recent form, and a high-scoring season finished with a 4-4 draw at Camden and a 3-3 result against Histon. Just four clubs in Abbey's division managed to complete all 14 of their fixtures, with Abbey only playing 11, so they had to settle for a distant but respectable fourth place. 1946-47: As Britain slowly recovered from the ravages of war, local clubs began to reform left, right and centre, and the Cambs League was expanded to five divisions: a 12-club Premier League and Divisions 1 and 2, with the latter two split into regionalised Sections A and B. United, now playing in shirts of amber and black quarters, entered neither the FA Cup nor the East Anglian Cup, but nonetheless spent most of the first half of the season competing in knockout competitions: only four of their 16 games before the New Year were league fixtures. It was another season of new faces and returning old boys. 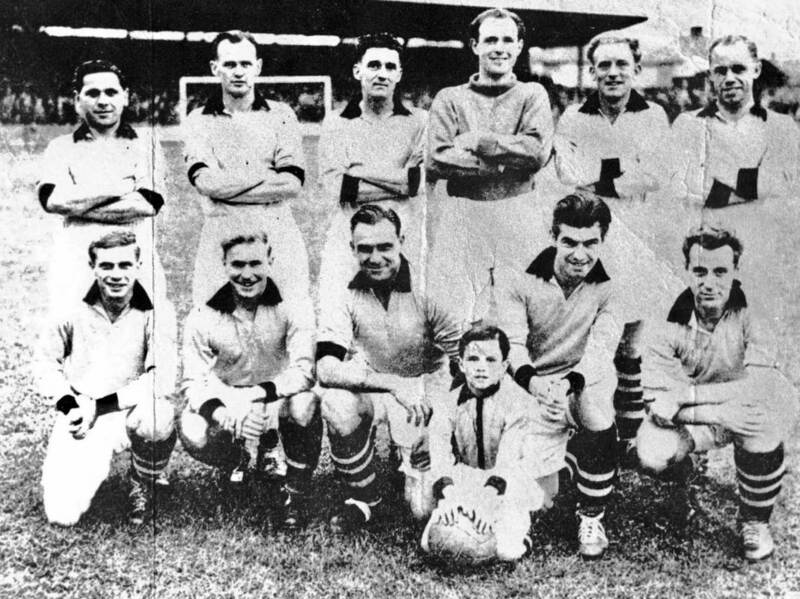 Sid Johnson lined up for the Wasps for his first game since December 1942 in their opening league match at home to champions Histon Institute, and United got off to the best possible start with a 1-0 win. They were soon brought down to earth in a 7-2 home defeat to Camden United, which saw the return of Russell Crane. United's starting XI soon settled down to a full-back pairing of Joe Richardson and Ernie 'Ted' Humphreys, a half-back line of Maxwell, Kimberley and Hall, and a forward line of J Wilson, T Watson, Bill Bailey, Crane and Jim 'Squatter' Smith. The team made a good start in the Cambs Challenge Cup, thrashing Cottenham 6-2 in a first round replay, then overcoming Saxons 2-0 – this was more like the old cup-fighting Abbey of the 1920s. Progress was also made in the Creake Charity Shield (United eventually went out at the semi-final stage, 2-0 to Camden), but the team exited the FA Cup Amateur Cup 6-1 to Ely, and the Cottenham Nursing Cup 3-2, again to Camden. By the end of the year, the Abbey had only played four league games and lay tenth out of 12 in the table. Every other club had completed at least six more fixtures, while pacesetters Camden and Histon had played nine. 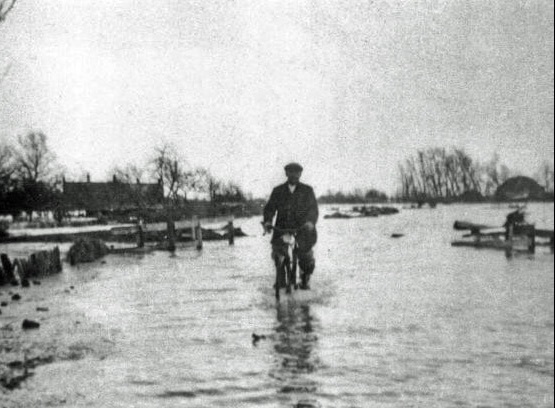 A long cold snap wiped out almost all of the Cambs League programme for two months, and when the thaw finally came the inevitable result was flooding, to catastrophic effect in the Fens. There was further consternation when the government ruled that midweek and evening football was suspended in the 'national interests', as the snow and ice had disrupted the delivery of coal. Mercifully, the authorities' stance soon thawed, but the season had to be extended until early June. The Cambs League finally restarted on March 22 and Abbey sprang out of the traps with a 6-1 victory at Sawston United. A week later they beat the same team by the same score at Newmarket Road. Ted Humphreys was able to resume playing in early April, and he was joined by Wally Wilson for a 2-1 win over Coton. Wilson remained for the rest of the season – the last hurrah of a long and glorious career. United gradually rose up the table as the games in hand were either won or drawn. ​Camden, who had clinched the championship in May, met United at Milton Road in the final of the Cambs Challenge Cup. Neither team was at its best in warm weather after a long season, and the Wasps went down gallantly, 1-0, to a team that had lost just one league game all season. United were due to play Saxons in a league match at the end of May, but with both clubs' Premier Division placings already decided at fourth and second respectively, the fixture was cancelled by mutual agreement. The season was reported to have finished thereafter, but Abbey played their latest ever league game on June 5, drawing 2-2 at Ely in a game that did not appear in the 'final' league table already published. 1947-48: The regional United Counties League was looking to expand and had formally invited Cambridge Town to join, but it was a semi-professional competition and Town, remaining staunchly amateur, declined. Abbey United treasurer Frank Pettit was at work at Watts' timber yard on Newmarket Road when a delivery driver informed him that the UCL wanted to recruit a Cambridge club. Pettit, discovering that the league's agm was to be held the following Monday in Stamford, hurriedly convened a committee meeting at the club's new HQ: the Ancient Druids pub in Fitzroy Street. The committee boldly decided to apply, despite misgivings about the presence of professional and semi-pro clubs in the UCL, and their application was considered at the agm. 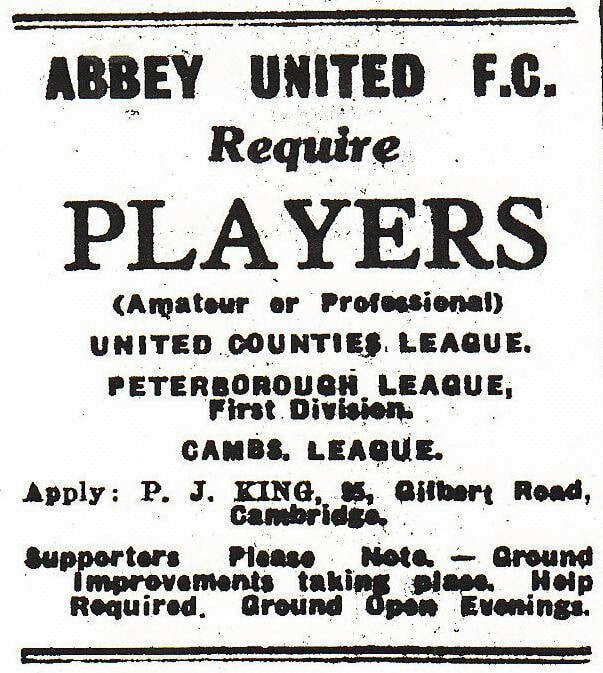 Some members had not even heard of Abbey United, and one wag asked if the team was made up of monks, but after hearing that the club had an enclosed ground where it could charge gate money, and the team had beaten Wisbech and only lost by the odd goal to King's Lynn before the war, they were accepted into the league. The new league would mean much more travel and expense for the club, playing opposition like Wisbech and King's Lynn as well as Spalding United, Stamford, Holbeach, Wellingborough, Rushden, Eynesbury Rovers, the 'colts' (youth) team of Leicester City and the reserve sides of Boston United, Kettering Town and Peterborough United. This was a big move for an ambitious little club. United's ground remained spartan. It had only one entrance, from Newmarket Road, and just inside there was a long, low wooden shed to the right offering refreshments, while much further down the same side stood the changing rooms, with a fenced enclosure for players and officials. The lone stand stood on the opposite side, where the main stand is now, and a wooden fence separated the ground from the allotments behind. Although United's players remained amateur and unpaid, the club's improved finances meant they could pay for some players to travel to away matches by taxi, picking them up from their day jobs. 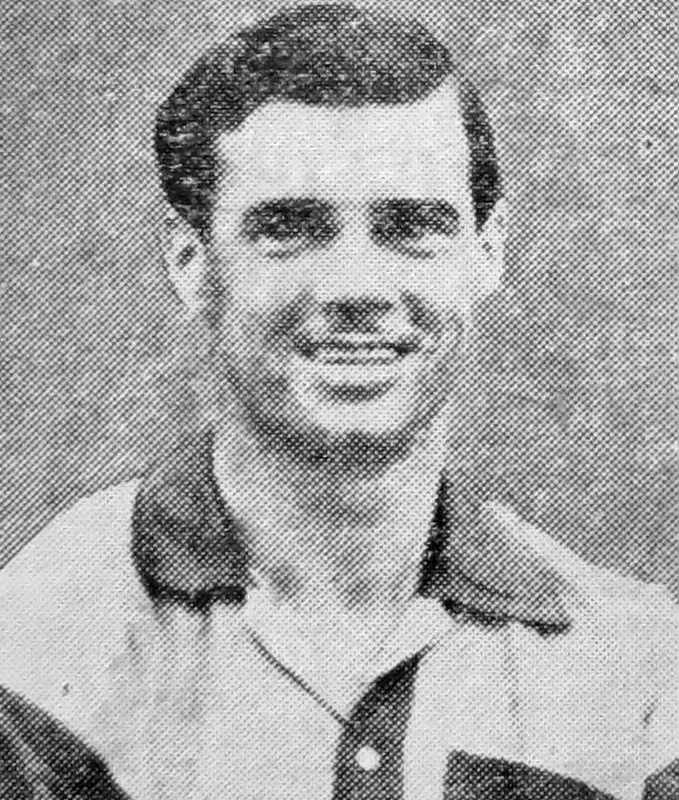 Two-footed right back Bob Bishop, 26, had come to Cambridge to manage a cinema, but he approached the club for a game and became the first former professional to sign for the Abbey. Albert George, now 22, returned to the club after a season with Saxons. He started at left half but proved so adept at goalscoring that he was pushed up front. Tony Gallego returned to keep goal after three seasons with Town and a brief spell at Norwich. He was joined by Reg Marsh, who had also spent a couple of years at Milton Road after turning out for Abbey in wartime. United were building an impressive squad. The club produced a matchday programme for the first time for their inaugural UCL match at home to Rushden Town on August 23. Priced at 2d, its cheery message on the cover was: 'Our intent is to provide our supporters with Good Clean Football.' Although United went down 2-1, the large crowd generated more gate money than all of the club's home league games from the previous season combined. The first two away games also ended in defeat, but the Abbey broke their duck with a 2-1 home victory against Symingtons of Market Harborough, in front of a bumper crowd of 1,500. They were beginning to establish themselves in the eyes of Cambridge football fans. The team was taking shape. In front of Gallego, full backs Joe Richardson and Ted Humphreys were reliability personified, and at wing half it was a choice of three from Bill Bailey, Reg Jones, Bob Bishop and Albert George. Reg Marsh and Cyril Kirby established themselves as first-choice wingmen, with Gaunt and Crane inside them, and it was only the position of centre forward to which no one could lay a convincing claim. Reg Kimberley, a club stalwart for many years, departed the Abbey for Histon Institute, just in time to play against his old club in the preliminary round of the FA Cup. The Stutes, conquerors of the Abbey once again, scored twice in extra time to run out 6-4 winners in a proverbial cup thriller. The early rounds of the FA Amateur Cup, with a 4-0 victory over Ely and a hard-fought 1-0 defeat of St Ives Town, were more straightforward. The following rounds saw St Neots & District defeated 4-0 and an absolute thriller against Achilles of Ipswich, in which United scored in a goalmouth scramble two seconds before the final whistle to clinch a 4-3 win. 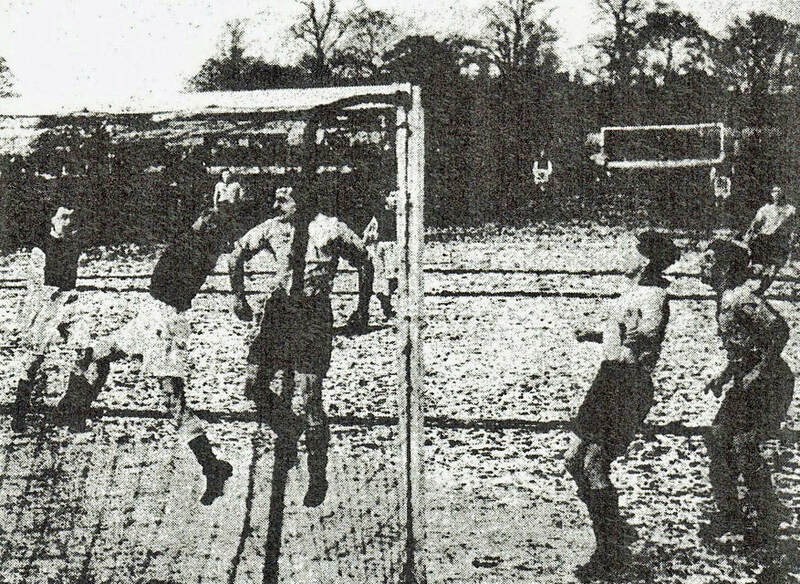 Abbey's reward for reaching the first round proper was a home tie against Town – only the fourth time the clubs' first teams had been drawn together in a competitive match outside the war years. Thus far Town had won 9-1 (1933), 3-0 (1938) and 8-0 (1945). A record 5,000 crammed into Newmarket Road on January 17 for the big showdown. The spoils went to the Town, 1-0, but the Abbey had shown that the gap between them and their cross-Cam rivals was shrinking. Highlights of the rest of the season included a 4-0 defeat of Leicester City Colts, a 1-1 draw with Peterborough Reserves and a remarkable 5-5 draw with Symingtons. 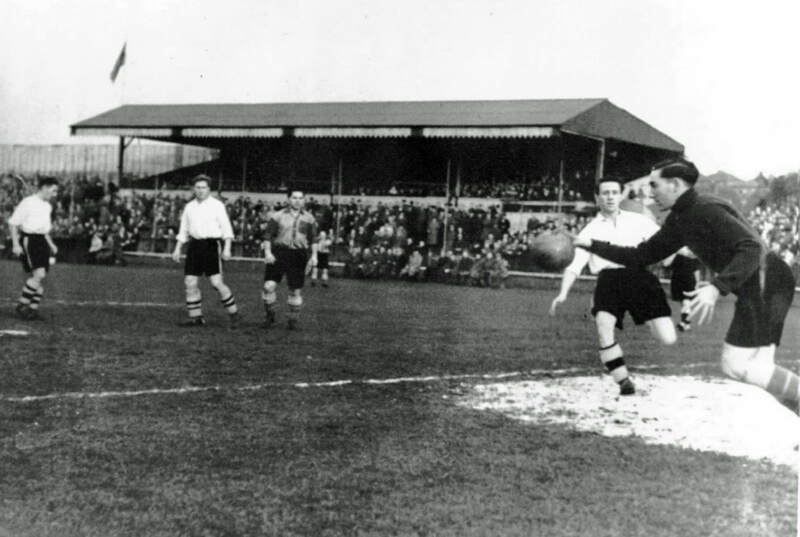 That match saw the league debut of Ron Clifford, with Ballard unavailable, and it transpired that Ballard had been playing for Fulham Reserves. He did not play for United again. The Abbey’s last home game was a goalless draw with Bourne Town, but a large and enthusiastic crowd let them know how much they'd appreciated the team’s efforts over a long, demanding season. United finished 16th out of 18 with ten wins and four draws from 34 matches, but overall it had been a most satisfactory first step, justifying the club's ambitious leap into the dark. 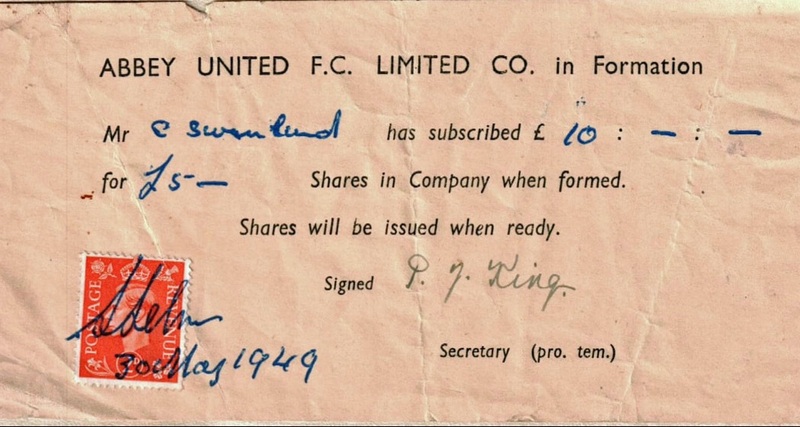 1948-49: The club's drive for progress continued during the close season, with more ground improvements, while with rationing still in place, United appealed for supporters to donate clothing coupons as they only possessed one set of shirts for the players. And thanks to advertisers, the club doubled the size of its programme from four to eight pages. United had a difficult start to the season as several players were still away on holiday, and a weakened team was defeated 4-2 by Symingtons before gaining a 3-3 home draw with Spalding. 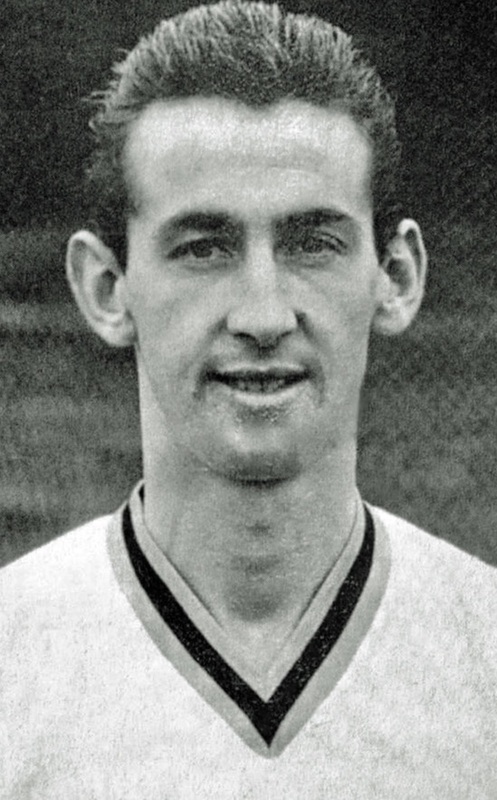 Ken Coates, signed late the previous season from Cambridge Town, had not convinced thus far at centre forward, so Derek King, who had played in that position before being switched to right back, was given a go for a visit to Northampton Town’s ‘A’ side. It worked a treat, as King fired a hat-trick in a crushing 8-1 victory. 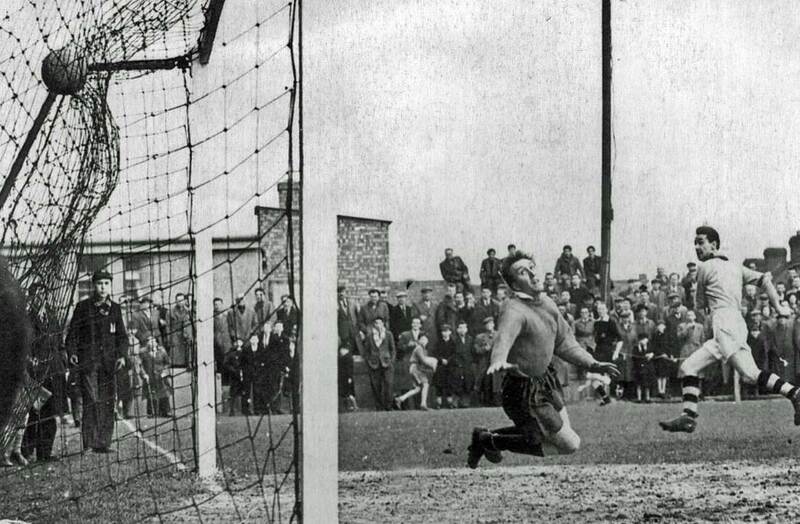 United, having received the toughest possible FA Cup draw, at home to reigning UCL champions Wisbech, fought out a 1-1 draw in front of 2,500 spectators – over three times the normal gate. In the replay in the Fens the U’s were overpowered 8-0 after shipping four goals in the first ten minutes of the second half. 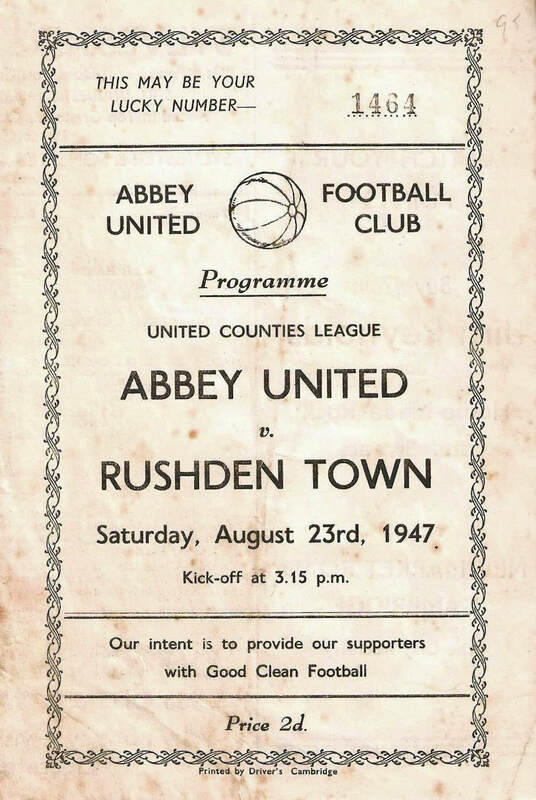 Abbey United on 18 September 1948. Back from left: Reg Barker (trainer), Albert 'Lofty' Adams, Brian Holmes, Tony Gallego, Albert George, Neville Chambers, Ernie Humphreys; front: Terry McGrath. Roy Taylor, Derek King, Russell Crane, Cyril Kirby. There was good news off the field with the town council's approval of United's plans for new stands, subject to the corrugated iron thereof being painted, and the club appointed its first player-coach (‘the growing vogue in football’) in AE Target, a left back who had seen service with Southampton, Millwall and Dundee. United overcame Ramsey Town in the first qualifying round of the Amateur Cup, and met the dreaded Histon Institute yet again in the second. The Stutes removed the Abbey from a cup competition for the fourth time in four years with a 5-0 thumping at Newmarket Road. From the end of October the Abbey only had the league left to play for, and it turned into a season of shipping and scoring goals. Against Wisbech, they lost 5-1 and 6-3. At Rushden, the final score was 6-1 … and Rushden missed two penalties. It wasn’t until just after Christmas that they won again in the league, defeating Rushden 2-1. Another piece of bad news was the retirement of Ted Humphreys due to injury – the dependable left back had served Abbey for 16 years. But there was also a key signing in David Robson, a clever inside forward previously with Crystal Palace and King's Lynn. He inspired the team to a 7-0 thrashing of Boston Reserves. By now, the club had found another player-coach, not that Target had ever played. 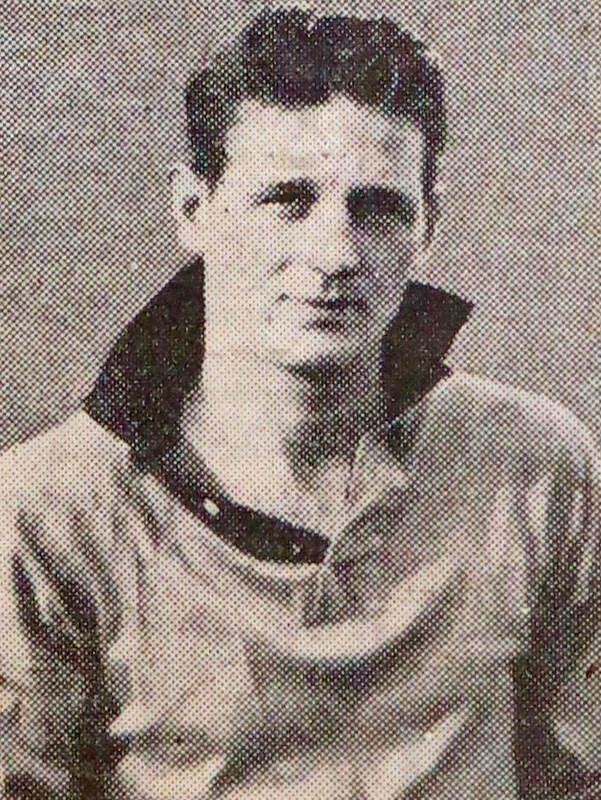 Len Hartley, a former Huddersfield and Burnley professional who'd played for Town during the war, took charge in January and led his team to its first clean sheet of the season in a 4-0 defeat of Northampton 'A'; Russell Crane was moved to the 'problem' centre-forward position and smashed a hat-trick. A week later a feeble Bourne side was hammered 7-0, Crane netting another four. The squad was strengthened with the signing of 'Taffy' Edwards, a well-travelled centre half, and he made his debut in a 4-0 beating of Peterborough Reserves: three games, 15 goals scored, none conceded. A final league placing of 12th in an expanded league of 20 clubs was very acceptable. In a high-scoring division, United were the only club to boast three-figure numbers for both goals for and against, scoring 101 and conceding 100. Top scorers were local boys Crane, with 42 league goals (in 37 games, a club record), and Albert George, who contributed 19. At a general meeting on May 16, it was resolved that United should form a limited liability company, with a share capital of £2,500. The club had been offered the freehold of the ground plus grandstand for £700, and a sufficient number of people came forward to either buy or promise to buy shares to give the club a guarantee of £1,000. These things take time to set up, and Abbey United Football Club (Cambridge) Limited – note the presence of the club’s place of operation in the name – was registered as Company No 482197 at Companies House on 17 May 1950. ​The board was shocked to find that the committee that had been running the cash-strapped club had been using the share capital for day-to-day expenditure, and it started as a limited company almost £50 in debt. It would take an FA Cup run in 1953 to take the balance into the black. ​1949-50: Abbey United was now officially a professional football club, in that it could sign players under a paid contract, so it was no longer eligible to enter the FA Amateur Cup. Its ground was still basic. The only seated accommodation was the small, standalone wooden stand on the Elfleda Road side of the pitch, containing wooden forms with room for 238 people, while the allotment end consisted of a small step-up terrace made from railway sleepers. The Brook side had a similar open-air terrace along with the very basic 'green hut' dressing rooms, while at the Newmarket Road end were the Supporters’ Club and a refreshment bar. Between the ground and the road was the Corona mineral water factory and the large, rambling Victorian house and gardens known as The Old Gardens; the entrance to the ground was a narrow passage along the boundary fence of the Corona works. There were no turnstiles; instead there was a wooden hut with three pigeonholes, while another entrance to the ground was an unadopted gravel lane 50 yards along the main road, known as Cut Throat Lane. United made a raft of new signings. Local boy Percy Anderson, 19, signed up to play inside or centre forward, and he was joined by another Cantabrigian: Stan Thurston, a 27-year-old winger with a mean turn of pace and effective body swerve. 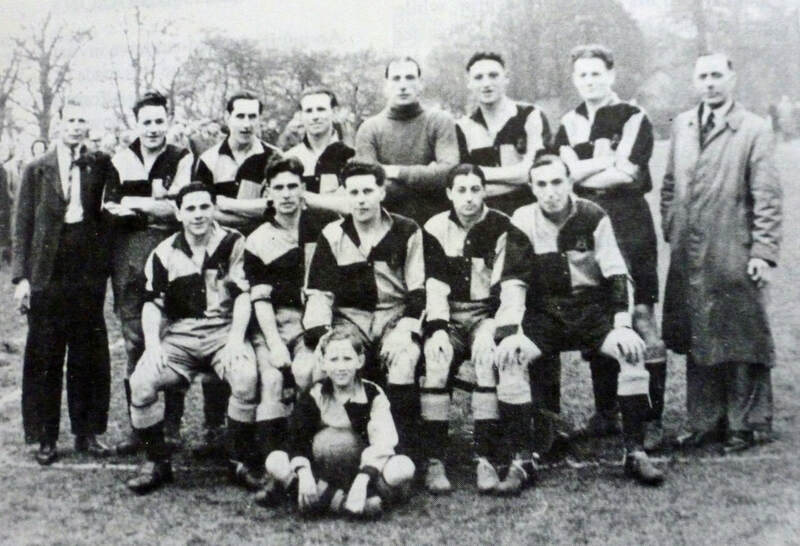 Other new faces were Cambridge-born left back Harry Bullen, 30; Fred Mansfield, 34, a right back from Guildford City (not the same Fred Mansfield who had played for United before the war); Alf Dunn, a versatile wing back from Dulwich Hamlet, and Jock Lewis, a left winger from St Albans. Tony Gallego retained his place in goal behind a stout full-back pairing of Mansfield and player-coach Hartley, and a half-back line of Alf Dunn, 'Taffy' Edwards and Eric Brown, with Thurston and Lewis on the flanks, David Robson and Albert George inside them and Crane leading the line. The news that United had drawn unbeaten Wisbech at home in the preliminary round of the FA Cup, meaning an influx of over 1,500 supporters from the Fens, led to frantic improvements in the banking around the ground. Staff and volunteers were amply rewarded when the Abbey recorded their first ever win over the Fenmen, 2-1. It was doubly disappointing, then, that they lost 1-0 at Newmarket in the next round. In the league, the Abbey were inconsistent, though home form remained solid. The selectors tried to find the best forward line: Albert George was tried on the left wing with Neville Haylock on the opposite flank, Thurston brought inside and reserve Ken Coates at centre forward to team up with Crane. They clicked in a 4-1 defeat of Desborough and a 3-1 win over Holbeach. Abbey's last four games were all at home, where they had lost only once all season (away from home they had won only twice in 20 attempts). Stamford were seen off 2-1, Northampton 'A' 3-1 and March 4-1, while the match against Coventry City ‘A' ended in a draw. A final placing of seventh with 42 points confirmed that the club was on an accelerating upward spiral, on and off the field. Crane was again the top scorer with 17 goals, and he was closely pursued by George and Thurston on 14 each. 1950-51: Before the season started the club lost dependable pivot Den Smith to Cambridge Town, and with the departure of Len Hartley, Harry Bullen was appointed as player-coach, with fellow full back Freddie Mansfield as his assistant. 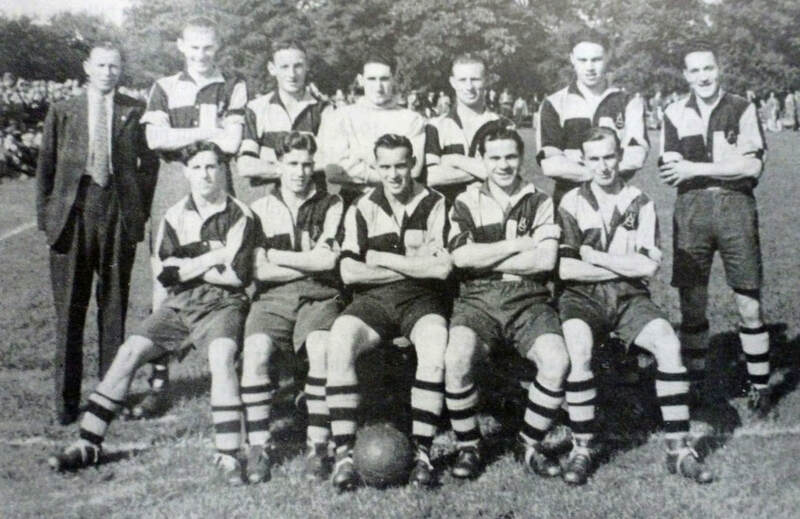 The team, now sporting plain amber shirts and black shorts with hooped socks, had high hopes of a United Counties League title challenge, but they got off to a surprisingly poor start, losing 2-0 at Stamford then drawing at home to Coventry City 'A' and Corby Town. 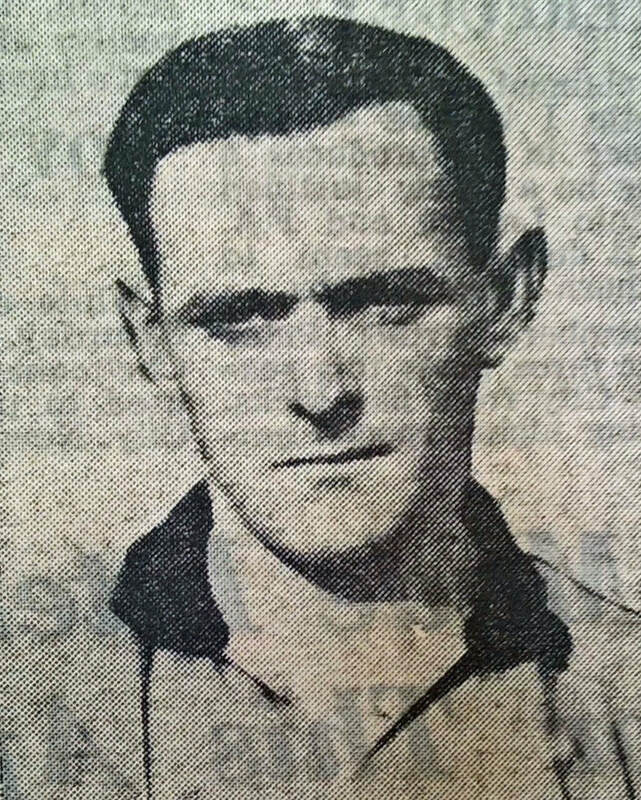 The Corby game saw the debut of right half Ray Ruffett, 26, who had fought in Greece, landed in France on D-Day and fought in the battle of the Rhine crossing; he was to captain United for several years with an unsurprising calm level-headedness. Another useful signing was made in the shape of left winger Neville Rose, 30. An even better capture was that of one of the most skilful and classy players ever to sport the black and amber: 33-year-old Eddie Connelly. The Scot had been spotted by Newcastle when he was 17 and he’d also played for Luton and West Bromwich Albion before the war. 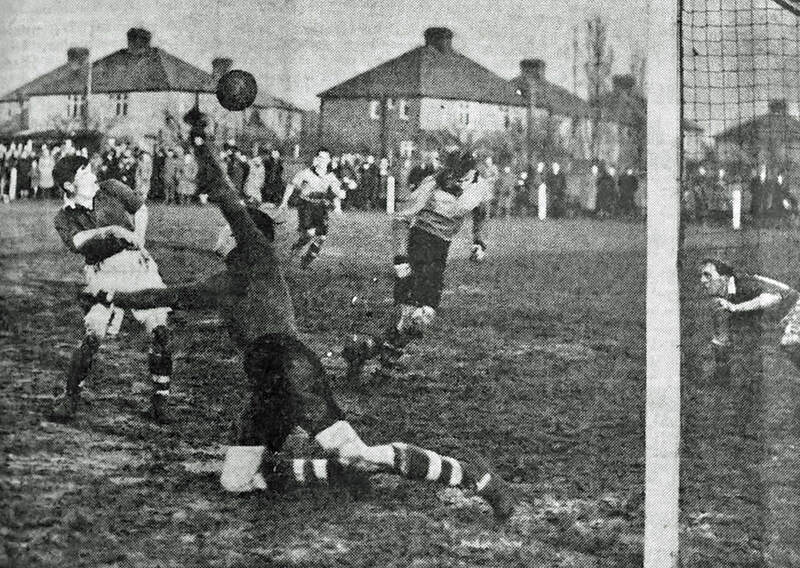 United finally won a league game at the seventh attempt with a deserved 1-0 victory at March, and a settled team began to emerge, with Tony Gallego in goal, full backs Mansfield and Bullen, a half back line of Ruffett, George and Neville Haylock, Stan Thurston and Rose on the flanks, and Russell Crane and Connelly at inside forward. In the replay, despite a gallant fight with Haylock off the field for 30 minutes, the visitors from Norfolk scraped home 1-0. After a shock 2-1 victory over Wisbech Town in the second round of the East Anglian Cup, the Abbey pulled off another impressive home win, 3-2 over Colchester Reserves. They would have to wait until March to play the semi-final. The full extent of the club's (therefore the company's) penury was faced at November's board meeting, when secretary NR Barker revealed that it would incur £668 in expenditure before the end of the year, but had only £23 in the bank. The directors resolved to obtain an overdraft facility of £600 (equivalent to nearly £20,000 in 2018), secured against the deeds of the ground. For the first time United were able to experience the novelty of football on Christmas Day. They gained a 2-2 draw at Eynesbury and in the return at Newmarket Road on Boxing Day, lost a league match for the first time since September 9, 2-1. In the new UCL League Cup, United threw down a declaration of intent with a 5-0 destruction of previously unbeaten Spalding in the second round, and the game was a personal triumph for Ken Coates, who hit four goals. Unfortunately, he was then sidelined for a month with varicose vein trouble, but the team made light of his and Connelly's absence by hammering Northampton 'A' 7-2, followed by a 4-2 away win at Bourne. United were third in the table by the time they faced their East Anglian Cup semi-final against Ipswich Town Reserves. In was a breathless, goal-filled thriller, the full time score was 4-4. Thurston scored in extra time, and Rose made in 6-4 a minute from the end. They were in the final. The first week of April was a monumental one in the history of Abbey United. 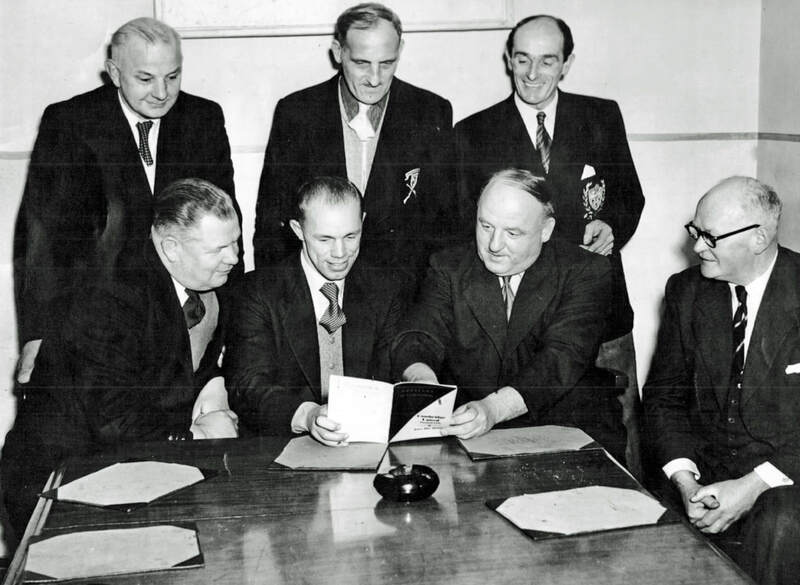 On the 1st their application for entry into the Eastern Counties League for 1951-52 was accepted. Three days later Cambs FA approved name changes for two of its most prominent clubs. Cambridge had been granted city status in recognition of its historical and administrative importance and economic success, so both Cambridge Town and Abbey United applied to change their names to Cambridge City. Cambs FA, ever practical, awarded the City name to Town as they had applied first, so Abbey's representative, Mr Barker, applied to change his club’s name to Cambridge United, which was agreed. United finished fifth, their best position yet, but a distant 15 points behind champions Corby. However, they still had three cup games to play. In the League Cup semi-final, United took on Stamford at home and a 'thrill-packed' match ended 1-1. But they were rather inequitably obliged to play the East Anglian Cup final on the ground of their opponents, Great Yarmouth, and succumbed 3-1. The final game of a long and momentous season was their replay at Stamford, it already having been decided that whoever made the League Cup final would have to play it next season. After 90 minutes, the score was 1-1. Stamford scored again three minutes into extra time, but a final monumental effort saw the Abbey equalise within two minutes through George, and Pierson won it five minutes from the end. What a season. Crane ended up as top league scorer again, on 22, closely pursued by Coates on 18 (from 19 games). Crane could have moved to Peterborough of the Midland League, but declined a substantial pay rise for the love of his hometown club. 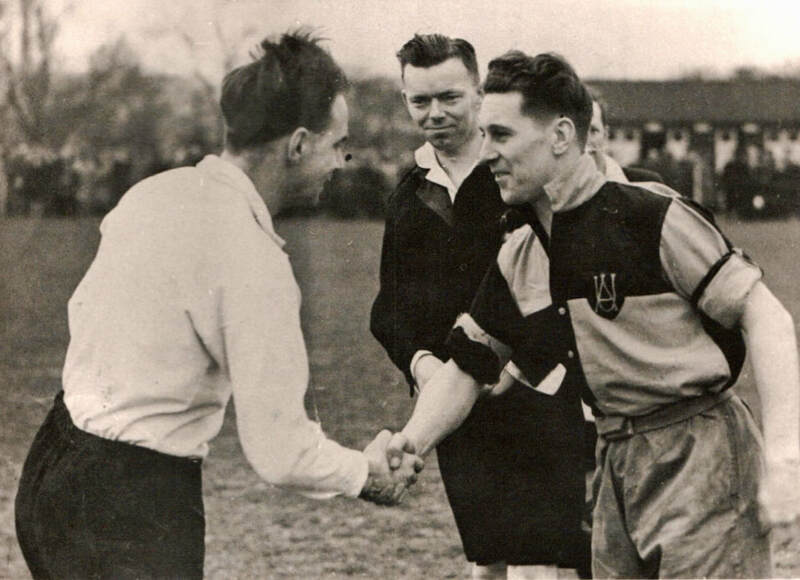 1951-52: Newly christened Cambridge United appointed their first full-time player-manager: Bill Whittaker, a former Huddersfield and Crystal Palace wing half. He was only 28 years old but looked much older, his hair prematurely grey after the trauma of being a rear gunner on bombing runs during the war. He was awarded a three-year contract on an annual salary of £520, plus a house rent-free. Whittaker’s main demands were that he be given full control of the players, their training and welfare and selection of teams, but he also insisted that he wanted to take on a number of professional players, at an initial weekly wage of £2. New blood in the team included inside forward Len Crowe, 23, a 'clever' player who possessed a tremendous shot; reliable right back Bob Bishop, 30, for a second spell at Newmarket Road; his brother Jack, 28, a skilful left winger; and Johnny Percival, 27, a tough-as-teak centre half who'd played top-level football with Huddersfield and Chesterfield. Alongside Ray Ruffett and Whittaker, Percival formed a fearsome half-back line on which the foundations of the new United were built. The club also reunited Tony Gallego with his brother Joe, a tricky inside left or winger. Whittaker soon instilled a professional and disciplined attitude within the club, and even in training he dished out hard tackles, which did not endear him to his players. On the field he was a commanding presence, always shouting and guiding his players and getting them to believe in themselves. United's opponents in their first ever Eastern Counties League match were Great Yarmouth Town. An excited crowd of 3,300 saw the hosts gain a resounding 3-0 victory, their first goal a 30-yard thunderbolt from Whittaker. The next item of business was the previous season's unplayed United Counties League Cup final. The outcome was never in doubt, with Symingtons put to the sword 6-0, including a hat-trick from Russell Crane. Whittaker enjoyed less success in other early-season cup competitions. In the FA Cup, United lost 4-3 in a replay to March and there was an early exit from the Eastern Counties League Cup (3-2 at Gorleston) and from the East Anglian Cup (3-1 to King's Lynn). The Eastern Counties League was an 18-club competition containing a mixed bag of well-established local clubs like King's Lynn, Bury Town, Wisbech Town, Lowestoft Town and Clacton, the reserve sides of Gillingham, Colchester and Chelmsford City, and the youthful 'A' teams of glamorous big guns Arsenal, Chelsea, Tottenham Hotspur, West Ham and Norwich City; these clubs played all of their matches away, giving United five bonus home games. United made a tremendous start to life in their new league home, winning eight and drawing two of their first ten matches, and by the end of October, they were the only unbeaten team left in the league. Chelsea's 'A' side was not expected to cause too much trouble when they visited the Abbey, but they bolstered their team with five players with first-team experience and snatched a 2-1 win to end United's unbeaten record. United still remained top, and for the first time, had drawn a larger crowd than City on a day when they were both at home – 2,980 were at Newmarket Road compared to 2,539 at Milton Road for the visit of Enfield. The game was a turning point, with United, despite a number of team reshuffles, losing their next four games by a single goal. By February, however, the winning touch had returned, with victories over Lowestoft 5-1, Gorleston 1-0, and Norwich 'A' 6-1. But they went down 3-0 to reigning champions and top-of-the-table Gillingham Reserves. Heavy snowfall disrupted fixtures, leaving four games to be played over Easter. Newmarket were despatched 7-0, but any lingering hopes of the title were dashed in a close-fought 3-1 defeat at King's Lynn. A final league placing of fourth behind Gillingham, Colchester and Gorleston was a very satisfactory outcome in United's first season in the Eastern Counties League, and fully justified the club's continued ambition. There were still two cup competitions. In the final of the Hunts Premier Cup, United faced Bedford Town at their Eyrie ground, the powerful Eagles fielding their full Southern League side. United were beaten 4-1, but despite the scoreline there was little to choose between the teams. 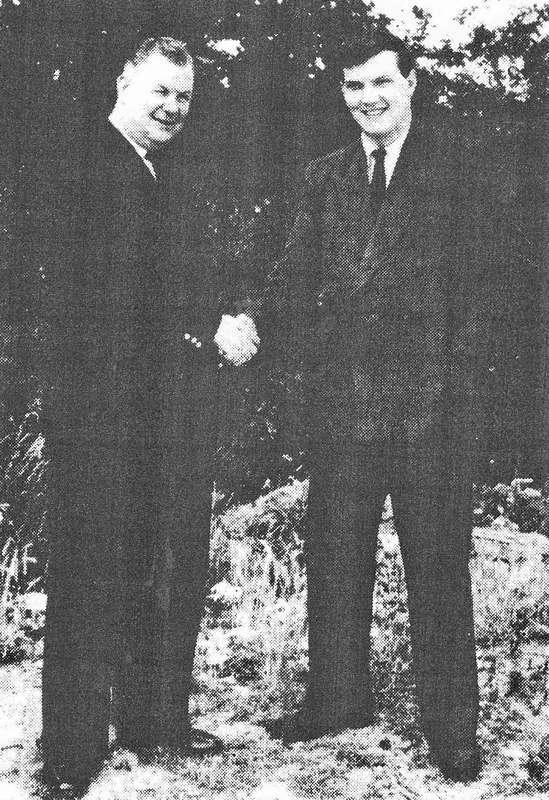 Behind the scenes, John 'Jack' Woolley, a local businessman with the Abbey Tyre Company, was persuaded to join the board by Frank Pettit despite saying he knew nothing about football. It began a long and fruitful association with the club. 1952-53: United's band of volunteers was active again during the summer of 1952, levelling and draining the playing area and squaring it up properly, as well as constructing new terracing at the Coldham Common end with capacity for 1,500 spectators. The side also had a new face on the right flank in the shape of winger Teddy Bowd, a 26-year-old local boy, described as 'sixty-four inches or thereabouts of human dynamite’. ​And in late September Len Saward, 25, joined; he was an elusive inside forward with a strong shot who cost £750 from Tonbridge. Otherwise, the team remained largely unchanged, with Tony Gallego in goal, Bob Bishop and Alec Mitchell at full back, the ever-dependable half-back line of Ruffett, Percival and Whittaker, Joe Gallego at outside left and Len Crowe and Russell Crane at inside forward. ​United started the league season in style, thrashing Gorleston 6-2 at the Abbey with new boy Thomas claiming four. In September they embarked on an eight-match unbeaten run , inflicting the double on reigning champions Gillingham Reserves, and were top of the league by early November. King's Lynn were the next cup opposition, and another record crowd of 7,344 at Newmarket Road watched an uninspiring draw. In the replay, to which six coachloads of United supporters travelled, keeper Gallego had a nightmare and the U's went down 4-0. Back in the league, after a less than merry Christmas, United were finally knocked off the top by King's Lynn. A week later they rediscovered their form in taking a 2-0 lead at Gorleston. But, to their frustration, the game was abandoned due to fog claimed to be no worse than at kick-off: a Gorleston official standing in for a missing linesman claimed he could not see sufficiently well. Points slipped through the team's hands due to profligacy in front of goal. Whittaker blamed a 'lack of ball practice. During the dark nights the lads don't have a chance to get in dribbling or shooting practice, with the result that they seldom touch a ball from one weekend to another.' The conclusion was that floodlighting was needed. In the final tally, Gorleston improved on their previous season's third place to become ECL champions by three points from King's Lynn. Arsenal 'A' came third and United finished fourth, six points off the top, having lacked the consistency to sustain a title challenge. However, they could look back resignedly on the abandoned game at Gorleston in which they had led 2-0 only to lose the rematch 1-0 – a swing of a potential four points. 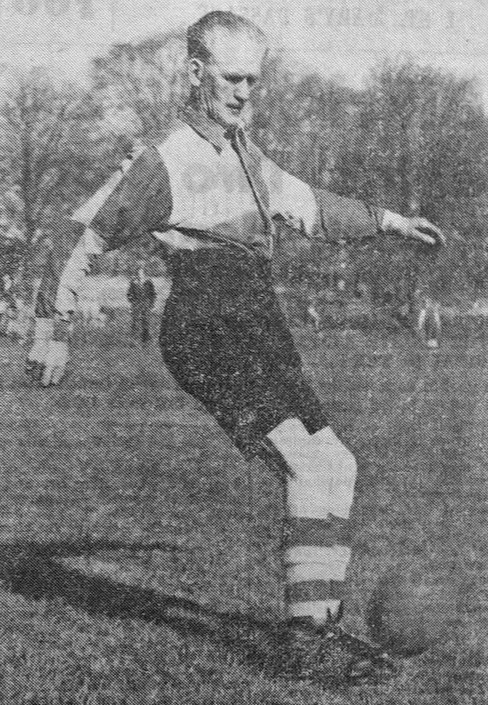 Thomas was top league scorer with an impressive tally of 27 goals in 36 matches, and Crane, Stan Thurston and Saward all reached double figures. 1953-54: During the close season the club signed outside left Les Stevens, 33, who had impressive experience at Tottenham and Bradford Park Avenue before becoming a colleague of Bill Whittaker and Jack Thomas at Crystal Palace. Other than that, the squad remained largely unchanged, with former Cambridge City keeper Bill O'Donnell and 17-year-old centre half Ian Martin the other new faces. The latter replaced veteran Wyndham 'Taffy' Edwards. Many of United's rivals liked to trumpet the signings of 'stars' with higher league experience, but Whittaker preferred to continue his policy of using local talent as far as possible. His only proviso was the need for a 'star' centre forward. Russell Crane quickly established himself at left back alongside the ever-reliable Bob Bishop, with the equally dependable half-back trio of Ray Ruffett, Johnny Percival and Bill Whittaker ahead of them. Stevens took the left-wing berth opposite Stan Thurston, who was soon supplanted by Teddy Bowd, while Jack Thomas, Joe Gallego, Len Saward, Len Crowe and Albert George tussled for the three forward positions. The U's were soon embroiled in the longest FA Cup run in the club's history. The first qualifying round saw a fairly routine 3-0 win at St Neots & District, but when Cambridge City v Cambridge United came out of the hat, the city was gripped with the proverbial Cup fever, especially as both clubs were the only unbeaten teams in their respective leagues. 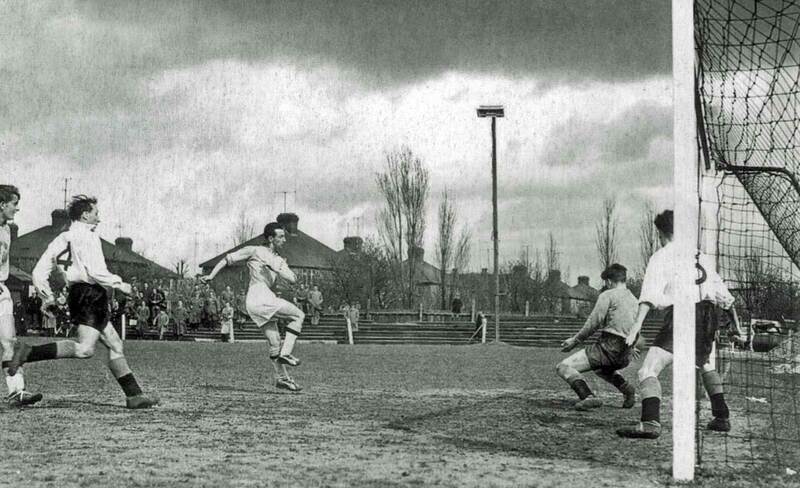 The match was a thriller: 'Every one of the 11,908 spectators at Milton Road who paid more than £650 at the gate seemed to feel that on the result of this match depended the whole future existence of football, Cambridge and the entire civilised world,’ said the CDN. With two goals from George and a penalty from Whittaker, the visitors ran out worthy 3-1 winners. United went on to defeat Wisbech and Stowmarket before drawing Third Division (South) outfit Newport County – their first ever Football League opponents – at home. A home record crowd of 7,500 saw United fight back twice from a goal down in a breathlessly exciting game to force a draw. In the replay, United produced a shock 2-1 win, a famous and historic victory. Keeper Arthur Morgan was chaired from the pitch by the English invaders, while director Geoff Proctor fainted with relief at the result, such was the boost to the club's dire finances. In round two, United received another home draw, against Bradford Park Avenue from Division Three North. The attendance record was shattered again when 10,000 people crammed into Newmarket Road. This time, though, United just could not hit top gear and the visitors ground out a 2-1 victory. The U's remain one of only two ECL clubs ever to defeat Football League opposition in the FA Cup. It was probably no coincidence that United lost their unbeaten league record between the Newport replay and the Bradford game, at home to Gorleston. But the team gathered itself to win both of its festive fixtures against Eynesbury before crushing Norwich City 'A' 7-1 on January 2, though it was so foggy that few of the spectators saw many of the goals. The previous day Newport had signed Saward, clearly impressed by his contribution to their Cup defeat. With Ruffett, Crane and Thomas on the injured list and Saward departed, the squad began to look a little thin. It was bolstered by another forward, Scotsman Frank O'Hagan, 27, who made his debut in a return-to-form 7-1 hammering of Lowestoft to which George contributed a hat-trick, and the winning habit continued with a 4-1 pasting of Chelmsford Reserves to take United to third with games in hand on leaders King's Lynn. But the fixtures were piling up, and from April 16 the U's were faced with nine games in 19 days, including six league matches, a Hunts Premier Cup tie, Whittaker's testimonial and the Cambs Invitation Cup final. It was a massive task for a small squad. In the end, United had to settle for third place, three points behind Clacton and six behind champions King's Lynn. For all the fame and fortune their FA Cup run had brought them, fixture congestion had surely contributed to their falling short in the league. George, Joe Gallego and Thomas all finished well into double figures in the goalscoring charts, but for the first time they were not joined by Crane at the top, firstly because he was now a left back, and secondly because he had missed the second half of the season through injury. In the Cambs Invitation Cup, now extended to seven clubs, United fought through to the final to face Histon, now a Spartan League outfit, in front of 5,645 at Milton Road. It finished in a goalless draw, and in the replay played the following September, United finished the job with a 3-1 victory. 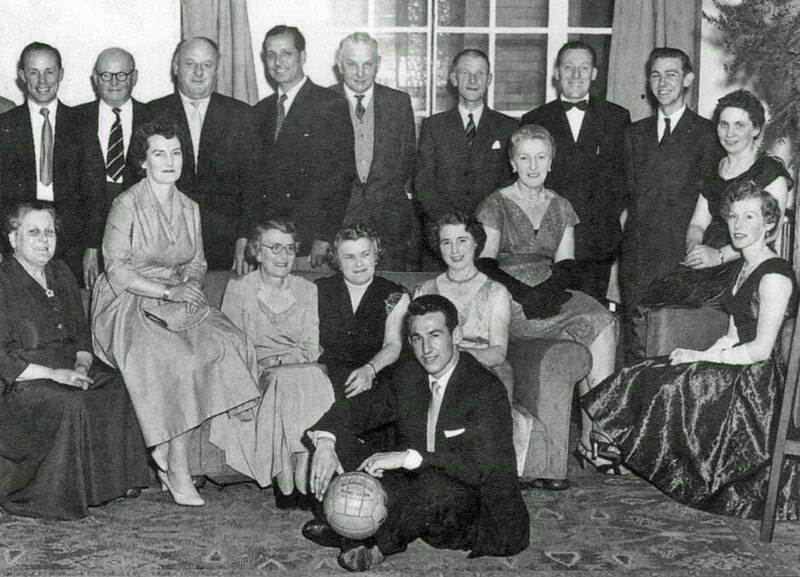 1954-55: For the new season, the club made a number of exciting new signings. The first was goal-getter Peter Dobson, 29, from Ipswich. He had a powerful shot with either foot and was said to be a real '90-minute man’. He was joined by three Scots: John 'Jock' Kyle, a 21-year-old inside forward previously at Histon, left winger Jimmy King, and 34-year-old Ian McPherson, a forward who had played over 150 times in the League for Arsenal. 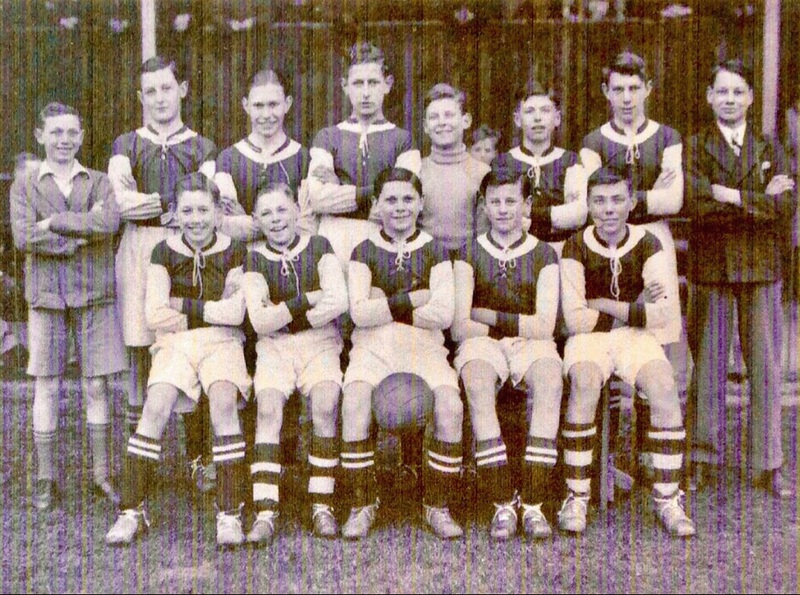 Percy Anderson returned to the club after a spell at West Bromwich and Stockport, and he was joined by 17-year-old Soham Town Rangers forward David Clark, whose shooting was so powerful that he had knocked out two opponents in April. Albert George departed the club when he became player-coach of Exning United. 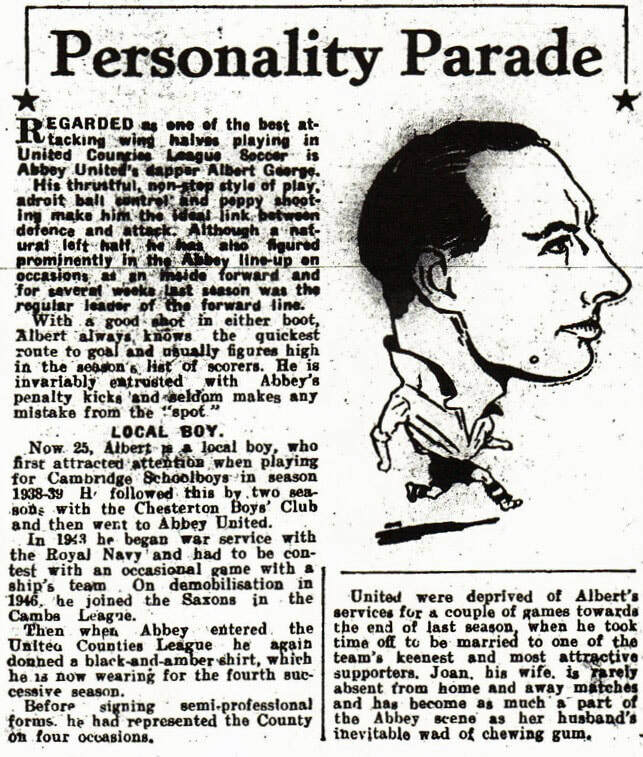 He had been with United since 1946 and was fondly regarded for his 'popularity and pleasant manner’. The team made a fine start to the league campaign, winning four and drawing two of their opening six matches. And they won a game in the ECL Cup for the first time thanks to a 2-0 win over Tottenham. A subsequent victory at Crittall Athletic earned them a semi-final visit to Lowestoft. 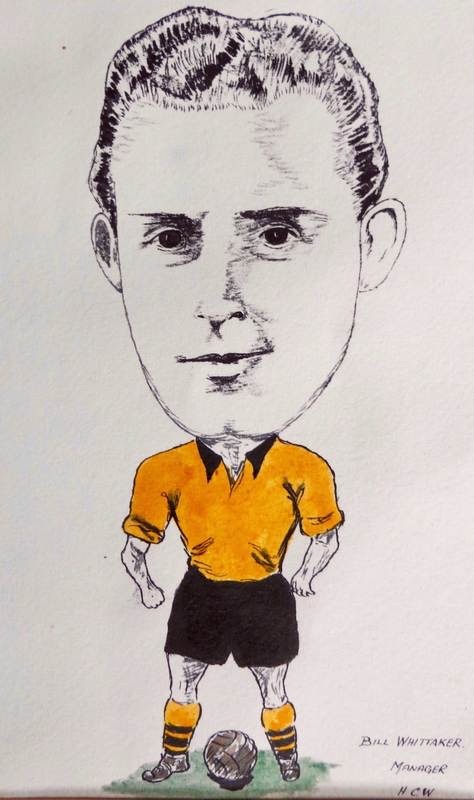 The U's rose to second in the table without a settled forward line but with a rock-solid base of keeper Arthur Morgan, full backs Bob Bishop and Russell Crane and an ever-present half-back line of Ray Ruffett, Johnny Percival and the boss, Bill Whittaker. After a 1-1 draw with Crittall, Whittaker was diagnosed with an ankle injury and ordered to rest for several weeks, and without their leader United collapsed to a 5-1 defeat at March in their worst display in recent memory; the goals began to dry up. The club was rewarded for its previous FA Cup exploits with exemption until the fourth qualifying round, and they reached the first round proper with a home victory over Eynesbury. After the previous season's excitement, the draw yielded another tie against Football League opposition, Division Three South's Torquay United. Their manager, Eric Webber, came to the Abbey to scout his opponents and saw them click with a 6-0 destruction of Gorleston. Whittaker declared himself 'happy and confident’ for the tie, but it all went wrong in the 11th minute when the hosts were awarded a penalty that even the home fans booed. United were in effect reduced to ten men when Teddy 'Touchline Terror' Bowd sustained a cruciate ligament injury, and they succumbed 4-0. Bowd put an elastic bandage on his knee on the train home and passed out due to a resultant restriction in blood flow. He was revived in the guard's van but was out of commission until the new year. Christmas 1954 was the first that was completely free from rationing since the war. United were given a festive derby in the shape of newly-elected Peterborough United Reserves. The U's won both home and away, 2-1 and 4-3, but the match was not seen as a Cambridgeshire derby: Peterborough was then in Northamptonshire, and the club's Fletton ground in Huntingdonshire. Popular forward Len Saward in action at Newmarket Road. ‘Local soccer bombshell’ shrieked the CDN headline on March 22: with two years left on his contract, Whittaker had resigned. The reason never became clear, although it may have been significant that United’s board had refused to allow him to enhance his income with an outside job. He had taken the club forward in leaps and bounds, both off the field with his sheer professionalism and on it with his credo of 'football all the time’. The following November Whittaker contacted United with a view to returning as a player, but his services were declined. Thereafter he did some scouting for Doncaster but was soon finished with football: a terrible waste of talent. He moved back to his roots in Blackheath, where he worked as a porter at the Covent Garden fruit and veg market. Like many people of his generation, he smoked 60 cigarettes a day, and he died of lung cancer aged just 54 on 30 August, 1977. When it came to the remaining cup competitions, the U's came to dread three words: March Town United. The Hares, who finished just above United in their first season in the Eastern Counties League, beat the U's 3-0 at Newmarket Road in the Hunts Premier Cup, 2-1 at the GER Sports Ground in the East Anglian Cup, and 3-2 in the final of the Cambs Invitation Cup at Milton Road. 1955-56: The start of the 1955-56 season was the most extraordinary in the club's history. The board took a huge gamble by appointing Gerald Williams, just 22 years old, as the club's new player-manager. He was a former Welsh schoolboy international who listed Blackpool, Birmingham, Accrington Stanley and Bolton as his former clubs, although he had only ever played for them as an unsuccessful trialist. He had previously been a PT instructor with the RAF, and as a tall striker his goalscoring efforts earned him the title of RAF Sports Personality of the Year for 1952 from Provost Parade magazine. Williams appointed his father George (ex-Port Vale) as club scout for the north of England, with one for the south to follow, plus an experienced trainer. 'I am fully confident that in two seasons' time I will have produced such a great all-round side from old and new material that the Eastern Counties League championship and the League Cup will be ours,' the new boss assured fans. Johnny Percival took over as team captain; Ray Ruffett and Tony Gallego moved to Eastern Counties League newcomers Biggleswade, while Les Stevens signed for Canterbury. The team that started the season against Lowestoft contained just three new signings: right half Ron Murchison, a 28-year-old Scot formerly with Ipswich who had joined the club before Williams; left half Bernard Butcher from Arsenal; and centre forward Bill Taylor from Newcastle. Len Saward opened the scoring within 30 seconds of kick-off and went on to complete a hat-trick in a 3-1 win in which the players were reported as looking in peak condition. United took on a new player-coach in Clive Walford, 25, a qualified FA coach formerly with Wellington and Birmingham who was about to take up a teaching position at Impington Village College. Arthur Morgan found himself out of favour under the new regime and departed for Ely, and he was replaced by former Cambridge City and Hendon keeper Ted Culver. One of very few surviving photographs of Gerald Williams, briefly player-manager (right). He is being welcomed by United chairman Geoff Proctor. Even worse, while his team had been losing, Williams had been in London having talks with 35-year-old left back Ralph Banks of Aldershot, who as a Bolton player had marked Stanley Matthews in the 1953 FA Cup final. When asked to comment about the defeat, he could only advise the News: 'I am a bit peeved about that, actually.' The board was a bit peeved too, and the young manager was dismissed with immediate effect. For the next ten matches the team was overseen by chairman Geoff Proctor, vice-chairman Jack Woolley and football director Paddy Harris, who presided over six wins and two draws. 'We want someone who will seek out local talent instead of importing players from all over the country,' declared Proctor. After a 2-1 defeat to Gorleston, a 1-1 draw with West Ham 'A' and a dreary goalless draw with Harwich & Parkeston, it was hard to believe that United were still lying second in the table. The new player-manager picked himself at left half for his first match in charge, at home to Biggleswade, and a revitalised United ran out 5-2 winners, with Johnson's play described as being as 'precise as a surgeon’. And better was to come the following weekend when, in the return at Biggleswade, the U’s trounced the hapless hosts 7-1, with a hat-trick from Peter Dobson. So had they turned the corner already? Not quite. Johnson was brought rapidly down to earth in the next game, a dismal 4-0 pasting at Lowestoft in which United resembled 'a band of naughty and badly disciplined schoolboys’. United became consistently inconsistent. An unlucky 1-0 home defeat to March was followed by a 7-1 trouncing at Clacton, a 3-0 defeat at Spalding, and a 9-0 massacre of Eynesbury Rovers at the Abbey on Boxing Day. 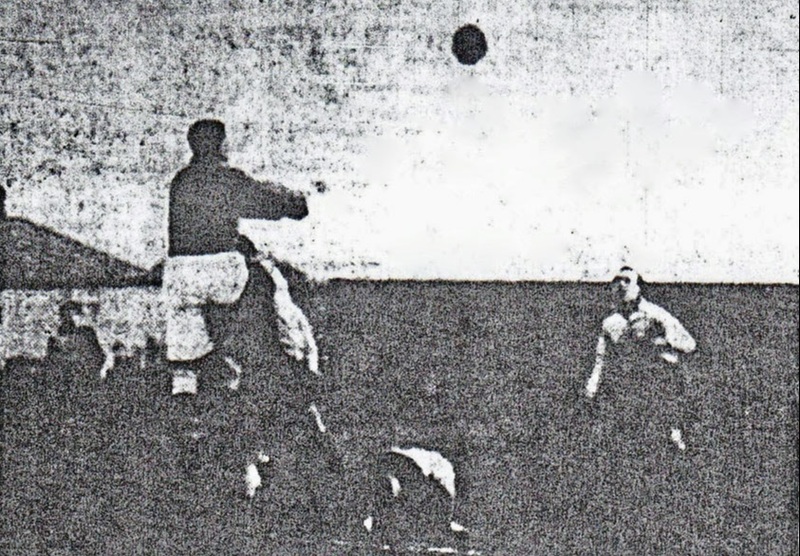 Dobson claimed four goals, Jock Kyle three, and the other two were the first in United colours for the player-manager. In the return match the following day, United could only manage a 2-2 draw, and the team's erratic form continued with a 3-0 home defeat to a classy Tottenham 'A' side, which Johnson had to miss as he was laid up suffering from the after-effects of the London smog. Away and home defeats to Peterborough's reserves followed. 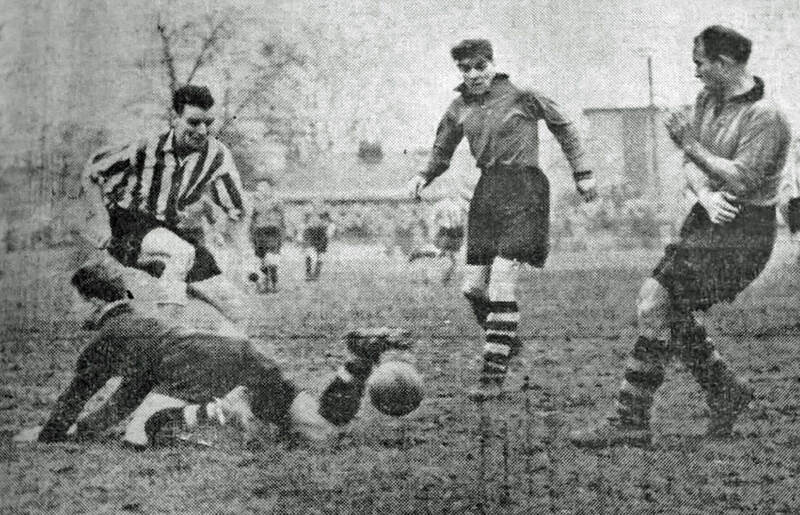 ​Johnson continued to shuffle his pack, giving 15-year-old inside forward Keith Dunn his first team debut in a 3-1 win at Stowmarket, where he also switched the versatile Crane from right back to centre forward, and the reliable veteran, who played in seven different positions that season, obliged with two goals. Stan Thurston was re-signed from Stowmarket to increase the options up front. There was some trepidation at a rematch with Clacton at the Abbey, but United exacted sweet revenge for their seven-goal beating by running out 2-1 winners, to underline their reputation as the league's great unpredictables. This was followed by a 1-0 victory over runaway leaders March Town United. Johnson signed two new boys: forward Tony Copping from Chesterford and winger Len Linturn, whose capture from City caused quite a sensation. But consistency still eluded the team, a run of three draws leading to a 'shameful capitulation' at home to West Ham 'A', 4-2. United then beat Gorleston 4-1 with a ten-minute hat-trick from Copping. United eventually settled for tenth place, a good 20 points behind champions Peterborough Reserves. Dobson comfortably topped the scoring chart for the second consecutive season with 19 goals, with Kyle the only other man in double figures. Bob Bishop retired from the playing side at the age of 35 and took up the position of trainer. 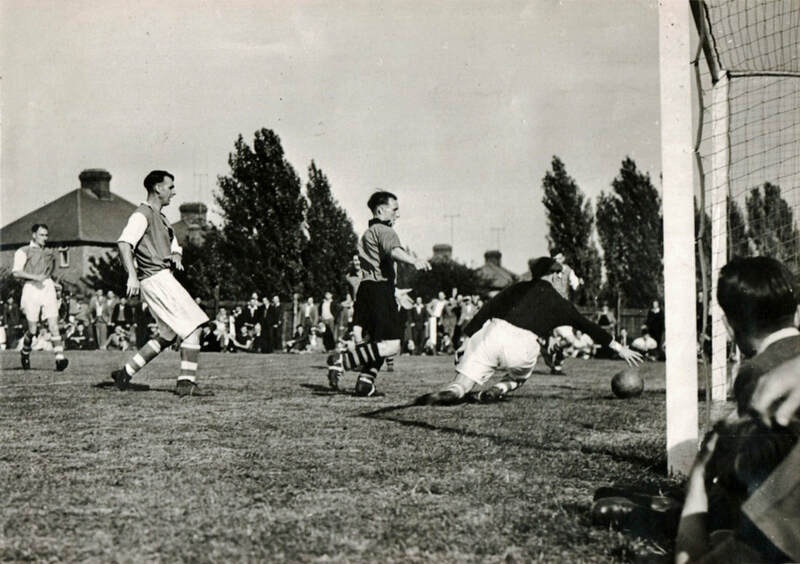 In the East Anglian Cup United eliminated two Norwich teams, City's 'A' team and CEYMS, the latter 4-1 win notable for Harry Bullen's first goal in six years at the club, which drew 'a tremendous roar' from the crowd. It was to be his only goal in black and amber in 219 appearances. In the third round the U’s were drawn away to Bury Town. The club from Bury St Edmunds had in January 1953 become the first in East Anglia to install floodlights, and on 6 December, 1955 United took part in their first game under lights at the Kings Road ground, running out 3-0 winners. They encountered much stiffer opposition – holders and four-times winners Romford from the ﻿Isthmian League﻿ – in the semi-final, and after a spirited 2-2 draw at Newmarket Road, United subsided 5-1 in Essex. The draw in the Hunts Premier Cup was even tougher: Posh's first team, on its way to the first of five consecutive Midland League titles before gaining election to the Football League. Another 5-1 defeat followed at Newmarket Road. That only left the Cambs Invitation Cup, and in the semi-final the U's drew 1-1 with Wisbech but lost their last chance of a trophy with a 3-1 loss in a disappointing replay at Milton Road. 1956-57: Work continued on the ground during the summer, and the pitch was widened to a playing area of 110 x 76 yards. The biggest news, though, was the signing of Wilf Mannion, who may have been 38 but retained the ball skills that had earned him the title of Golden Boy. Mannion arrived in Cambridge at the end of July, and advised that he had not played since March and would probably be a little rusty. Other new signings included Brian Iley, 19, a former Tottenham trainee now with the RAF, and Albert George, making a sentimental return to his first club from Exning. United started erratically in the league. Their opening match at Holbeach ended in a 1-0 defeat, although Mannion was described as 'out of this world’. The first home game, however, resulted in a 5-3 win over Bury Town, and Mannion made the first goal, hoodwinking the visitors' defence by allowing the ball to run through his legs for Kevin Barry to score, and scored the fifth himself two minutes from time. The team was still to gel, though. Pivot Johnny Percival had left for Bexleyheath & Welling and Ron Murchison had had to fill in out of position, with Russell Crane a temporary replacement for Bob Bishop at right back while ahead of them Bert Johnson chopped and changed to find the right forward line. Worse news came when Mannion picked up an injury that was diagnosed as a slipped disc, and with a knee problem also flaring up, he missed eight of the team's first 14 league games as well as several cup matches. Meanwhile the team struggled to beat 'feeble' bottom club Biggleswade 3-2 and went down 5-4 at home to Chelmsford Reserves. So far the mix just was not right. Early cup form was also disappointing: United made an early exit from both the Eastern Counties League Cup and the East Anglian Cup. After a fine 5-0 replay win over Holbeach in the FA Cup, they were 'giant-killed' in humiliating fashion, 5-2 at the Abbey, by Ely from the Peterborough & District League in the second qualifying round. Fresh blood was needed, and it arrived in the shape of the Moores. First to sign, in November, was Bernard Moore, 32, a wily centre forward formerly at Luton and Bedford. With him leading the line and Mannion back to fitness, the team began to click. In December, Northern Irishman Brian Moore (no relation) arrived with a fascinating back story. He was on his way towards an exciting top-class career at West Ham when, at the age of 21 at Middlesbrough on Boxing Day 1955, he was hit full in the face by a clearance. Somehow he played on, dazed, in those days before substitutes, but he collapsed on the train on the way home and in hospital it was found that the lace in the heavy leather ball had so damaged the retina in his right eye that he was in effect blind on that side. After Moore gave up football some blurred sight began to return to his damaged eye, but he was informed by doctors that another blow to the face could result in total blindness. Nonetheless, when Johnson approached him in late 1956 to offer the twin carrots of a job with Pye Telecom and a place in the U's team alongside the legendary Mannion, he could not resist. Brian Moore went on to score a phenomenal 116 goals in 162 games for United, his attacking colleagues Mannion and Ron Murchison calling out to tell him when their slide-rule passes were coming in on his 'blind' side. The team's form continued to improve, with two more home wins before the festive season. After a goalless draw at Eynesbury on Christmas Day, Mannion scored his first 'double' for United the following day in a 2-1 return victory. And, with a settled attack and a reinforced back line, the U’s began to build a run of results, with seven consecutive league victories into mid-February. They were now the 'entertainers' of the Eastern Counties League: Mannion created havoc with his passing in a 5-3 defeat of March in February, the News stating 'occasionally, he aroused amusement with some neat juggling with the ball’. The team remained unbeaten throughout March, although they dropped points at Sudbury and at March Town United, where without an injured Mannion they were observed to resemble a ship without a rudder. Previously ever-present keeper Ted Culver sustained a season-ending injury and by way of replacement Johnson recruited one of his former Bexleyheath & Welling alumni: Alan Crawley, a 20-year-old who had just completed two years' national service overseas. United continued to entertain their way up the table, and after a breathless 5-4 away win at Great Yarmouth, the News enthused: 'This truly fantastic match … was so exciting that one lady fainted and another smoked five cigarettes in ten minutes.’ An unbeaten league record going all the way back to December 15 – a run of 17 games – was finally ended in controversial style in the last away game of the season, as United went down 4-3 at Clacton. A 1-0 win at home to Great Yarmouth wrapped up a league season in which a strong second half had seen them finish sixth, seven points behind champions Colchester Reserves. Both Moores made double figures in goals scored, although Barry topped the goal chart with 16. It all augured well for a tilt at the title the following season. In the Cambs Invitation Cup United defeated Wisbech 2-1 in a replay at Fenland Park, and Pegasus were overcome 3-2 in the semi-final in front of 6,872 spectators at Milton Road. The final, on Easter Monday, was the occasion for another much-anticipated clash with City, who enjoyed home advantage. United confirmed their 'noisy neighbours' status with a 1-0 win, the attendance an impressive 9,668. The U's also reached the final of the Hunts Premier Cup, but their opposition was Bedford, who had hammered Norwich 4-2 away in the FA Cup before losing narrowly to Reading. The game was held over until August, but United gave a good account of themselves at the Eyrie and only lost 4-3. 1957-58: Ground improvements continued apace, with the construction of new dressing rooms and a boardroom at the main entrance, created from a wooden hut purchased from a disused army base in Quy. The asking price for the hut was £40 provided the Supporters' Club dismantled it and transported it themselves, which was done in record time. With the completion of foundations for the retaining wall on the city side, the pitch could be moved 14 feet, so that the side with a small stand was now large enough to contain a larger replacement stand in due course. Admission prices were raised to 1s 6d. New faces included Vince Donnelly, a powerful Irish forward from Charlton; Neville Brown, a left winger formerly with Histon and Luton; and 30-year-old half back Matt McNeil from Norwich. The club also signed John McKinlay, 20, a Scottish wing half registered with Rangers who was allowed to play for United while he did his national service down south. The most exciting signing, though, was, that of 35-year-old full back Frank Lock, who brought with him the experience of over 300 League games with Charlton, Liverpool and Watford. The team started its league season with three high-scoring score draws, demonstrating that although it could boast a tremendous forward line of Len Saward, Wilf Mannion, Bernard Moore, Brian Moore and Kevin Barry, it tended to leak goals as fast as it could score them. Johnson maintained that the most important yardstick of his team's performance was the number of goalscoring opportunities made, not the amount of possession. The deep-thinking manager also kept a record of every goal his team conceded so that he could identify any common failings. United set about remedying their lack of floodlighting in October 1957. They were due to stage a benefit match for Saward against his brother Pat's Aston Villa, and Len used some of his testimonial fund to purchase a set of ‘floodlights'. The lights were primitive, consisting of four lamps perched on top of telegraph poles, costing £14 each. However, Villa were unable to make the date, so the lights' first use, and the first ever floodlit match at Newmarket Road, took place a week later on October 21: an East Anglian Cup first round replay against Great Yarmouth. Fittingly, Saward scored the first goal in a 3-0 victory. 'The lights on each side are sufficiently powerful to overlap in the middle of the field!' enthused the News. The floodlights were put to use again in the next round of the East Anglian Cup, a 5-0 win over Stowmarket, and by then they had been improved with reflectors and an increase of 1,000 watts per group. In the third round, Norwich bolstered their reserve side to claim a 3-2 win at Newmarket Road. United's FA Cup challenge did not last long, a 6-2 victory over St Neots followed by a disappointing 4-1 defeat at March. But they had more fortune in the Eastern Counties League Cup. They started with an excellent 3-1 second round win over league leaders Tottenham 'A', then despatched a struggling Stowmarket side 4-1. After an underwhelming start in the league, young keeper Alan Crawley was relegated to the reserves. In replacement United recruited Welshman Glanville 'Taffy' Jones, 20, from West Bromwich and also signed up 27-year-old former Liverpool and Bradford Park Avenue keeper Jim Begg. 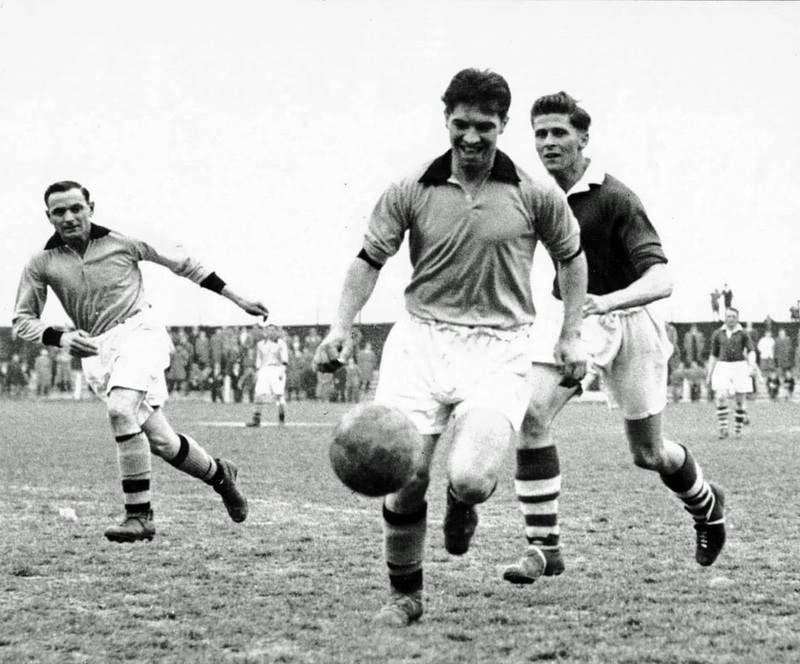 The extent to which the balance of power had shifted in the city of Cambridge was illustrated in the first round of the Cambs Invitation Cup, when United outclassed City 4-1 in front of a home crowd of 4,900. The Cambridge Daily News said the result 'emphasised the gap between the professional and the man who plays for nothing more than the love of the game.’ The U's began to score more than they conceded, thanks in no small part to the new man in goal. They despatched Stowmarket 9-0 with Brian Moore claiming four, Gorleston 4-1, and bottom club Bury Town 4-0. The team hit top gear in December, with Mannion claiming a hat-trick in a 6-0 mauling of Gorleston, and, with goals in a 3-1 win at Colchester and a 3-0 victory over Biggleswade, Brian Moore had reached the 30-goal mark in all competitions before Christmas. The tradition of football matches on Christmas Day had almost died out and the only, and last ever, ECL game on that day in 1957 was at Newmarket Road, where United defeated Eynesbury 4-1. They extended their unbeaten league run to 15 matches into the new year, defeating Great Yarmouth 7-2 away and 2-1 at home, followed by a 'nonchalant' 4-1 victory away at March. It was something of a surprise that the unbeaten record should be lost in mid-February to a team they had thrashed 9-0 three months earlier. A much improved Stowmarket won 4-2, scoring three goals in the first 28 minutes. A Barry hat-trick helped to eliminate Spalding 4-2 in the League Cup semi-final, but it all went wrong in the two-legged final against reigning league champions Colchester Reserves. Against a younger, fitter, faster side, United went down 5-1, leaving the away leg as a formality, which Colchester duly won 5-1. In the Cambs Invitation Cup United dispatched March 2-0 in the semi-final, but there was more final disappointment when they lost a replay 3-1 at Fenland Park. A 2-1 win over Colchester Reserves, however, ensured United second place in the Eastern Counties League, their best ever finish. Their goals tally topped the ton for the first time in the ECL, and of their 108 scored, Brian Moore claimed an astounding 49 in 36 games, plus 19 in cup competitions. Bernard Moore chipped in with 12, Barry ten, Crane eight and Mannion seven. Although United had not won the Eastern Counties League in their seven years of competition, the club's ambition to progress remained as fierce as ever, and when the Southern League decided to expand from one division of 22 clubs to two, they resolved to apply. City also threw their hats into the ring. In January they had taken the momentous step of abandoning 50 years of amateurism and turning professional, due to financial difficulties caused by dwindling crowds and lack of success in the field. On April 29 United and City were both accepted into the South East Section of Southern League. This was the first time the two teams had been in the same league, and the beginning of a truly serious rivalry. Not everyone was pleased at United's progress, though. Elfleda Road residents complained that when they had moved in, United had been a small club attracting a few hundred spectators on a modest open ground, but now brought in upwards of 3,000 to a built-up venue with floodlights, loudspeakers, shouting and cigarette smoke. The Supporters' Club was also considered a menace: 'Having finished their evening, these boisterous individuals, fortified by their beer, make their way down the unmade road to the council estate.' Such was the price of progress.